What’s the best diet for reducing your risk of heart attack and stroke? A large, randomized 5-year study conducted in Spain suggests that a traditional Mediterranean diet may be the leading contender. At the start of the study, none of the participants had been diagnosed with cardiovascular disease, though they did have either type 2 diabetes or at least three major cardiovascular disease risk factors including smoking, high blood pressure, high LDL cholesterol levels, low HDL (sometimes called “good” cholesterol) levels, being overweight or obese, or having a family history of coronary heart disease at a younger age. After nearly five years, the study found that the people who ate the Mediterranean diet plus additional olive oil had a 30% lower risk for heart attack and stroke, and death from cardiovascular disease. Those who ate the Mediterranean diet plus nuts had a 28% lower risk. The study also found that the Mediterranean diet lowered heart attack, stroke, and death from cardiovascular disease risk for people who carry a gene variant that increases the risk for cardiovascular disease. Three or more servings of fresh fruit per day: Whole fruit, rather than juice, offers you the added benefit of fiber and the antioxidants contained in the fruit’s edible skin. Two or more servings of vegetables per day: Try to eat a variety of fresh vegetables, both raw and cooked. Three or more servings of fish or seafood per week: Choose wild-caught Alaska salmon, troll- or pole-caught albacore tuna, farmed oysters, Pacific wild-caught sardines and herring, which provide a high level of heart healthy omega-3 fatty acids, which studies have linked to reduced inflammation, lower triglycerides, and lower blood pressure. Three or more servings of legumes per week: You can add these beans, lentils, and peas to soups or stews, make them into dips like hummus, or include some in your salad.The study diet also included eating two or more servings of sofrito, a sauce of tomatoes, onions, garlic, and herbs simmered in olive oil, per week and encouraged eating white meat rather than red meat, avoiding soda, commercial baked goods, processed meats, and spread fats like margarine. For those who regularly drink wine, the diet also included seven or more glasses of wine with meals per week.Obviously there are some individuals whose genetics predispose them to benefit more from a low carb or low fat diet, but that is a whole other topic.Even if you’re not ready to switch to a 100% Mediterranean diet, following a few of the habits above could still have a positive effect on your cardiovascular wellbeing. 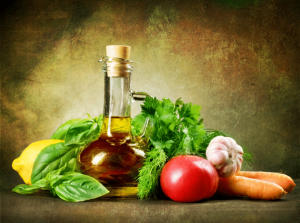 Learn more about the Mediterranean diet and how you can reap its health benefits in this video.